A properly functioning differential provides traction and stability your vehicle needs for the wheels to rotate at different speeds. Repairing a faulty differential is something only a trained mechanic should tackle. But, it is possible to check the fluid level yourself. You basically use the same steps for all makes and models of trucks. Before you crawl under your vehicle, park the car on a level surface and backup your vehicle on either stands or a ramp. Never crawl under a car lifted with only one jack. You will also need a source of light so you can get a clear view of the parts. A flashlight will provide plenty of light so you can see underneath the vehicle and locate the check bolt on the differential. After your vehicle is turned off and safely raised, crawl underneath the rear-end of the pick-up truck. The differential is located under the middle of the truck’s rear and is shaped like a pumpkin. Once you have located it, you will need to find the check bolt. This is located on the pumpkin shape facing the back of the truck. Use a ratchet to loosen the check bolt. Once the check bolt is off, look for the level of the fluid. The gear oil should be level with bolt’s hole on the differential. If not, you might have to stick either your finger or a zip tie into the opening to determine the fluid level. If you are not able to feel fluid on your finger or see fluid on your zip tie, you need to add more fluid to your differential. The fluid’s level is only one reason to change the fluid in the differential. You should also change the fluid if it is dirty. Dirty fluid can contain metal or water which could discolor it. Fluid should be routinely changed around every 30,000 depending on the use of your vehicle. If you have an older model truck you may want to check your fluid on a monthly basis. 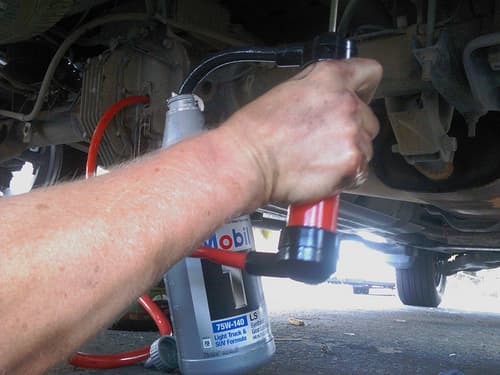 Replace the check bolt and wipe off any residual fluid. Lower your car. If your fluid was low or dirty you should replace it with the recommended fluid for your make and model of truck.